New Liturgical Movement: The Dominican Rite and the "Last Gospel"
The Dominican Rite and the "Last Gospel"
It is not generally well know that the Dominican Rite did not adopt the use of the "Last Gospel" (John 1: 1-14) as a priestly thanksgiving at the altar after Mass until 1600s, well after its adoption in the Roman liturgy. In fact, we made this addition under pressure to conform to the Roman practice, because in most places the laity had come to expect the priest to recite John's Prologue at the end of the liturgy. The Dominicans had continued the medieval practice of having the priest recite the canticle Benedicite Omnia Opera (Dan. 3: 58-88--still found in Sunday Lauds) while returning from the altar to the sacristy as his thanksgiving. The Roman liturgy of the post-Tridentine period did include that canticle, but as part of the priest's prayers of thanksgiving after Mass. 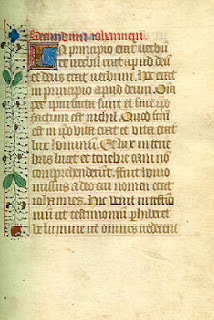 Dominican practice also adopted, as I suppose the Roman also did, the practice of replacing John's Prologue with the proper Gospel of the Sunday or of the ferial in Lent, when this was overridden by that of a saint's day or other solemnity. Sadly, that practice was dropped by our Rite in 1961, when all other "Last Gospels" were suppressed except for that of the Day Mass of Christmas, when the Gospel of the day is John's Prologue. The Last Gospel for that day is that of Epiphany, the visit of the Magi in Matthew. There seems to have been considerable resistance among the Dominicans to this novel practice. For example, at Low Mass, Dominican rubrics, as in the 1933 Dominican Missal, specified that the server was to extinguish the candles immediately after the blessing, that is, during the reading of the Last Gospel. This silent protest caused enough comment that, in certain places such as the Eastern Dominican Province in the United States, manuals for altar boys, like that of William Bonniwell in the 1940s, told the servers to wait until the Last Gospel was over before snuffing the candles. In my own Western Province, however, older priests tell me that the practice of snuffing during the Last Gospel continued until its suppression in 1963. I might also add that at least at all the sung Masses in the Dominican Rite that I have attended, the choir and congregation began the (admittedly non-liturgical) recessional hymn immediately after the blessing, as the priest went to begin the Last Gospel. There was another way in which the Dominican Rite registered a quiet protest against the introduction of this Roman practice. Our text of the Last Gospel was different, although only in its punctuation, not in its words. In the Roman version, the Latin reads: Omnia per ipsum facta sunt, et sine ipso factum est nihil quod factum est; in ipso vita erat. Which is "Everything was made through him, and without him was made nothing that was made; in him was life." The Dominican reads: Omnia per ipsum facta sunt: et sine ipso factum est nihil: Quod factum est in ipso vita erat. (Note the capital Q.) That is, "Everything was made through him and without him was made nothing. What was made in him was life." I distinctly remember the different position of the "full stop" pause when I first heard Dominicans like Fr. Joseph Fulton, O.P., of saintly memory in my province, saying the old Mass when I was novice. I always do it that way myself. I had immediately noted that the pause was not where I heard it as an altar boy in my secular parish back in New York. This variant was not an accident. The Dominican punctuation and phrasing reflects the thirteenth-century break in the text as seen, for example, in the exegesis found in Thomas Aquinas' Commentary on the Gospel of John (chapter 1). Even if we had to adopt a Roman liturgical practice in the seventeenth century, we did so using the thirteenth-century version of the Gospel text! It gives me a certain pleasure to note that modern biblical critics, as shown in the critical edition of the Greek (available, e.g., at http://www-users.cs.york.ac.uk/~fisher/cgi-bin/gnt?id=0401) place the "full stop" period after "nothing," as the Dominican version does. A member of the Dominican Community here at the Angelicum reminded me of that today at recreation after pranzo. The Dominicans dropped the Roman practice of reading the Last Gospel during the liturgical reforms of 1963, as I discussed in my history of the Dominican liturgy from 1946 to 1969 posted earlier on this site. So the "Last Gospel" is absent from the 1965 Dominican Missal. But, sadly, this edition also displaced the Benedicite Omnia and gave celebrants the option of reciting In Principio as a thanksgiving on the way back to the sacristy, or even of omitting it entirely. The image included in this post is the Prologue of John from a fifteenth-century French non-Dominican manuscript: where it is included as a devotional prayer after the calendar, not as a "Last Gospel."